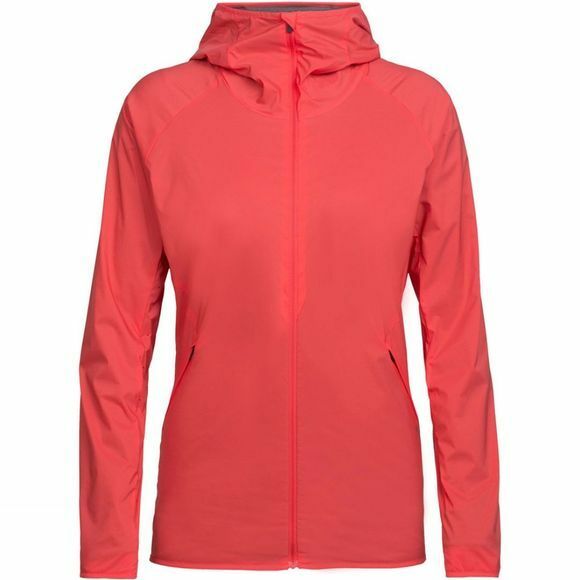 The Womens Coriolis Hooded Windbreaker Top from Icebreaker combines classic weather-resistant performance with an innovative merino mesh lining to help manage moisture, the Coriolis Hooded Windbreaker is a technical lightweight shell layer perfect for all your travels, trail runs and other active days in unsettled weather. This innovative layer features a wind- and water-resistant Pertex Quantum Air face fabric with a DWR finish to shed blustery conditions. Inside we lined the jacket with a soft and lightweight eyelet mesh corespun fabric, which aids in moisture transfer and provides the ultimate combination of next-to-skin softness and durability. An upper back yoke vent as well as strategically placed laser-cut holes maximize the jacket’s ventilation performance, while the raglan sleeve construction improves mobility during active pursuits. A fitted hood adds protection when the weather turns, zippered hand pockets secure your essential items, and reflective hits improve visibility in low-light conditions.